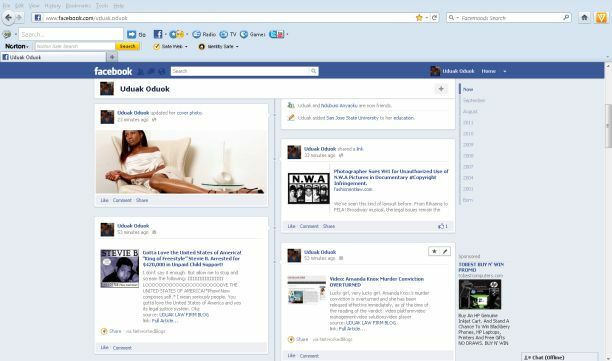 What do you all think about the new Facebook Timelines? Many Facebook users do not have “Timelines” installed, yet. But I do! Call me an early adopter. 🙂 I really like the timelines interface, if you will. I managed to even customize my personal page with one of my model pictures as the “cover shot” and it feels like I have my own mini-magazine. It makes for easy reading and navigation and let’s me see my journey thus far on Facebook.In any event, there have been so many articles written on the new Facebook timelines since it rolled out just last week. But, you all know a story on Timelines and Facebook is not quite complete until the legal system has its hands in it. On the backend, the law already stepped in with legal agreements to structure this kind of deal, but we also now have a lawsuit on our hands. That, folks, is most interesting for me to discuss with you all. “Facebook has been hit with a lawsuit over a trademark dispute surrounding the new Facebook Timeline profiles. Timelines.com asserts that if Facebook is allowed to move forward with the launch of Timeline, it “will essentially eliminate Timelines.com” and cause mass confusion that Timelines.com is affiliated with Facebook. Facebook Timeline, a feature that was unveiled last week and will be rolled out over the coming weeks, transforms the Facebook user profile into a virtual scrapbook that lays out your digital history. Long time readers, you recall I have discussed what an injunction is. If you are just joining us, an injunction, in simple English, is where you ask the court to prevent or stop someone from doing something you believe harms you. In the case of music, if you are a musician whose music is stolen i.e. copyright infringement , beyond suing the infringing party, you can file for an injunction to immediately stop any and all further distribution of your music. Through your attorney, you would file your injunction. Once you file your injunction, the other side, the opposition, would respond to tell the court why the court should not grant your injunction. In this instance, Facebook won that legal hurdle against Timelines.com/Timelines Inc. This, nevertheless, does not affect the trademark infringement lawsuit filed by Timelines Inc. and in fact, Facebook has agreed to delay release of its Facebook Timelines, pending resolution of the lawsuit. Let’s look at the skeletal outline of what is at issue here. Timelines is suing Facebook for trademark infringement and it has also sought injunctive relief. Timelines Inc. wants the court to stop further infringement of its trademark aka injunctive relief. The court has denied the injunctive relief. They also seek compensation and monetary damages, among other legal remedies. With trademarks, there are three key laws that govern. Federal law aka as the Lanham Act; b) State statutes (law); and c) common law that deals with trademark and unfair competition. Essentially, this means the law here is developed on a case-by-case basis. How does this all Shake Out with Timelines Inc. v Facebook Lawsuit? The law says if Timelines Inc is the first business to use “Timelines” as a trademark in the marketplace, then Timelines owns the trademark and its rights are superior to that of other subsequent users aka ‘junior” user. Whether customers are likely to be confused is one of the central issues in a Trademark infringement suit. Courts will look at whether the subsequent aka Junior user to Timelines has similar goods/services. They will look at the territories that the alleged infringer markets and the intent of the alleged infringer. Courts pay attention to who used the mark first. Here, Timelines is also arguing that its Timelines are similar to that of Facebook’s new Timelines. Is it? That is a decision the jury will make should the case proceed to trial. How Does the Court Determine What Qualifies as a Trademark? Timelines sought Injunctive relief, among other damages. This is a common remedy and is costly. Facebook made a successful argument that it would really harm Facebook, economically, if it was not allowed to proceed with the launch of its new Timelines. To really illustrate the economic harm Facebook would suffer, assume you are a record label owner and an artist has claimed you infringed on their “copyright” which is distinct from trademarks but serves as an illustration as the results are parallel. Assume the artist sought an injunction and the court granted it? This would mean you as a label would have to pull thousands/millions of units of your products off the shelves if the court found there is indeed an infringement of another’s mark? Same idea with Facebook and its Timelines. If the Court finds that Facebook deliberately copied Timelines.com, guess what, the court can order Facebook to pay a large amount in damages. How do you prove the intentional copying element? You look to see if Timelines was listed on the Federal Trademark Principal Register at the time Facebook allegedly copied it. Obviously there is more analysis involved than the blanket rule stated above and trial lawyers on both sides would roll their sleeves and get to digging into case law to help prove or disprove intentional copying; depending on which side of the fence they are on. I expect and legally your attorney, if you have a legal suit of this nature, should and can anticipate a defendant like Facebook to argue that they can own the same mark, among other arguments. Can Other Brands Own the same or similar Timelines mark? Yes. The key thing is to show that it does not create customer confusion. Majority of suits filed do not necessarily go to trial but are negotiated and resolved through settlements. Trademark infringement suits are no exception. I expect this case will resolve pretty soon. Litigation is just too costly and in Facebook’s instance, it really halts the new technology that can allow them to build a better user experience.